Model 1418LMB Comby feature the lavatory housing measuring a width of 18 inches (457 mm). The lavatory bowl is multi-sided. Fixture is arranged to be installed on finished wall and serviced from an accessible pipe chase. The comby is designed to meet water conservation and the rigorous demands of security facilities. WaterSense recent advancements have allowed toilets to use 1.28 gallons (4.85 liters) per flush or less while still providing equal or superior performance. The WaterSense label is used on toilets that are independently certified to meet rigorous criteria for both performance and efficiency. Only water-saving toilets that complete the certification process can earn the WaterSense label. Must use optional HET valves to meet WaterSense label requirements. When facing a Modular Service Center or a Lav-Toilet Comby, the toilet is at a 45 degree angle from the left hand corner of the cabinet. When facing a Modular Service Center or a Lav-Toilet Comby, the toilet is at a 45 degree angle from the right hand corner of the cabinet. The fixture is mounted on the floor and is plumbed for a wall waste outlet. The fixture is mounted on the floor and is plumbed for a floor waste outlet by others. An anti-squirt bubbler with mouthguard for directing water into the lavatory. This option should be specified where mouthguards are required by local codes. This option provides an anti-squirt bubbler without a mouthguard. Use of this option provides a vandal and suicide resistant drinking bubbler which is designed to prevent use as a suicide device. 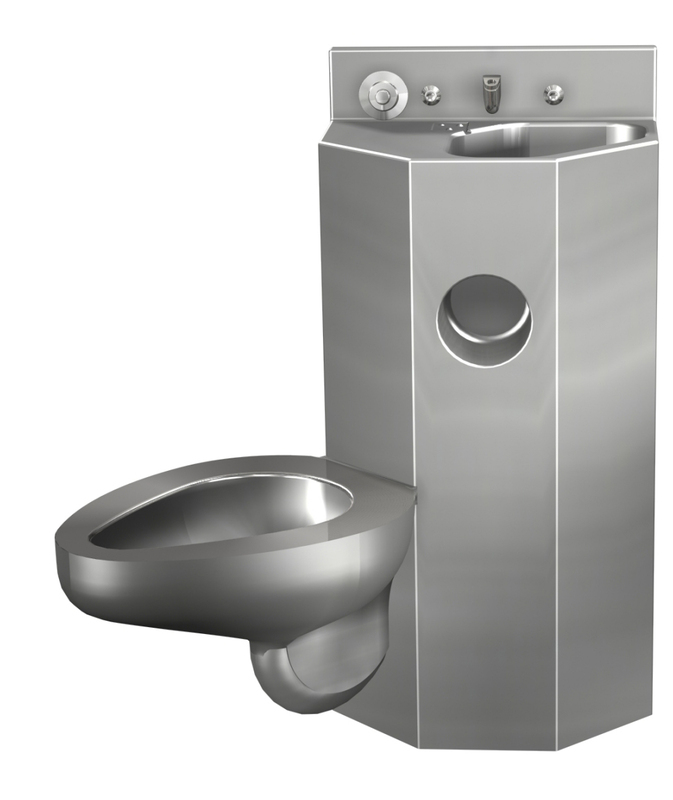 Additionally, the bubbler design inhibits its use as a device to dislocate and remove handcuffs in a correctional facility. Recommended use is with optional -PBH Hemispherical Pushbutton. This option provides a bubbler which directs water into the lavatory basin only. This single temperature valve is for use with the Master-Trol Valve Controller. The 24VAC solenoid, soft closing valve features pushbutton activation, is provided with a stainless steel strainer and integral checkstop. Valve conforms with the lead free requirements of NSF61, Section 9, 1997; Federal Public Law 111-380 and ADA requirements. Refer to EVS catalog sheets regarding Master- Trol options and technical data. This single temperature valve is for use with the Master-Trol Valve Controller. The 24VAC solenoid, soft closing valve features piezo touch activation and is provided with a stainless steel strainer and integral checkstop. The Piezo buttons have no moving parts and are touch activated. When the Piezo buttons are touched this closes the circuit and activates the controller which activates the valve. Valve conforms with the lead free requirements of NSF61, Section 9, 1997; Federal Public Law 111-380 and ADA requirements. Refer to EVS catalog sheets regarding Master-Trol options and technical data. This hot & cold valve is for use with the Master-Trol Valve Controller. The 24VAC solenoid, soft closing valve features pushbutton activation, is provided with a stainless steel strainer and integral checkstop. Valve conforms with the lead free requirements of NSF61, Section 9, 1997; Federal Public Law 111-380 and ADA requirements. Refer to EVS catalog sheets regarding Master-Trol options and technical data. This hot & cold valve is for use with the Master-Trol Valve Controller. The 24VAC solenoid, soft closing valve feature piezo touch activation and is provided with a stainless steel strainer and integral checkstop. The Piezo buttons have no moving parts and are touch activated. When the Piezo buttons are touched this closes the circuit and activates the controller which activates the valve. Valve conforms with the lead free requirements of NSF61, Section 9, 1997; Federal Public Law 111-380 and ADA requirements. Refer to EVS catalog sheets regarding Master-Trol options and technical data. Valve assemblies can be manifolded to serve up to four fixtures from a single supply inlet. The valve assembly can be remotely located up to 10 feet away from the actuation pushbuttons. Two Single Temperature valves or two sets of Hot & Cold valves are manifolded. Option is available on Acorn Air-Control™ Valves or valves utilizing Master-Trol or Time-Trol. Valve assemblies can be manifolded to serve up to four fixtures from a single supply inlet. The valve assembly can be remotely located up to 10 feet away from the actuation pushbuttons. Three Single Temperature valves or three sets of Hot & Cold valves are manifolded. Option is available on Acorn Air-Control™ Valves or valves utilizing Master-Trol or Time-Trol. Valve assemblies can be manifolded to serve up to four fixtures from a single supply inlet. The valve assembly can be remotely located up to 10 feet away from the actuation pushbuttons. Four Single Temperature valves or four sets of Hot & Cold valves are manifolded. Option is available on Acorn Air-Control™ Valves or valves utilizing Master-Trol or Time-Trol. This hot and cold valve is a pneumatically operated, pushbutton valve that uses atmospheric air. The pushbutton is vandal-resistant and requires less than 5 pounds to activate valve. Valve can be remotely located up to 10 feet from the actuating button and is ideally suited for small chase areas. Metering, only on the hot side,provides an adjustable timed cycle flow from the valve. Timing is adjustable from 5 to 60 seconds. The Air-Control™ valve features non-hold open pushbutton activation, and is provided with a stainless steel strainer and an integral checkstop. Valve conforms with the lead-free requirements of NSF61, Section 9, 1997 and ADA requirements. This single temperature valve is for use with the Time-Trol Valve Controller. The 24V solenoid valve features pushbutton activation and is provided with a stainless steel strainer and integral checkstop. Valve conforms with the lead free requirements of NSF61, Section 9, 1997 and ADA requirements. Use of this option eliminates the requirement to provide electrical power and wiring for units with -MVC1 Time-Trol. Each solenoid valve is powered by a concealed 9 volt battery (Not included). This hot and cold valve is for use with Time-Trol Valve Controllers. The 24V solenoid valve features pushbutton activation and is provided with a stainless steel strainer and integral checkstop. Valve conforms with the lead free requirements of NSF61, Section 9, 1997 and ADA requirements. Use of this option eliminates the requirement to provide electrical power and wiring for units with -MVC2 Time-Trol. Each solenoid valve is powered by a concealed 9 volt battery (Not included). Toilet design that works utilizing 1.28 gallons (4.85 liters) per flush, thereby reducing water consumption. This flush valve assembly is intended to be used with Master-Trol Valve Controller and can be used on combys, toilets and urinals. The 24VAC solenoid operated flush valve features pushbutton activation and is ADA compliant. Refer to EVS catalog sheets regarding Master-Trol options and technical data. This option is for the electronic valve system with a single Piezo pushbutton. The Piezo pushbutton has no moving parts and is touch activation. When the Piezo pushbutton is touched this closes the circuit and activates the controller connected to the flush valve. 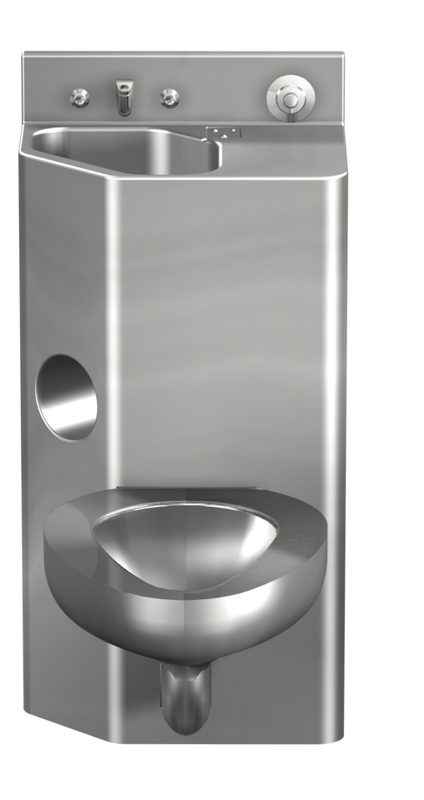 Toilet/Urinal flush valves can be opted out as it would be supplied by others and not by Acorn. This option is for the flush valve to be activated by a hydraulic pushbutton. This option is ADA compliant to be activated by 5 pounds of force or less. This is only available as a concealed flush valve (typically for toilet with a rear or wall supply configuration). Provides an Acorn Time-Trol System for limiting frequency of flush valve operation through electronic control of a solenoid flush valve. Pushbutton conforms to ADA requirements using less than 5 lbs. to activate. Refer to individual MVC catalog sheets in Valves section for technical data. This option is for -MVC Time-Trol valves. This feature enables the user to terminate the metering cycle at any time by simply pushing the pneumatic actuator pushbutton on the fixture. Please note assemby does not include tee. This option provides a 6" stainless steel four prong hook in the cleanout. Hook is connected to 31" steel wire rope and is connected to a 4" brass plug with a 4-1/2" bolt. Plug to bolt connection is water tight. With this specification, the inlet consists of a slip joint O-ring connection and permits a plus or minus 1/2" horizontal adjustment. The outlet is 4" no-hub. With this specification, the inlet consists of a slip joint O-ring connection and permits a plus or minus 1/2" horizontal adjustment. The outlet is 3" no-hub. The lavatory waste is directed into the toilet bowl on a Lav-Toilet Comby by way of a removable tube. Please consult local code requirements prior to specification of this option. This option is to have the trim installed at the Acorn Engineering factory. The trim includes pushbutton(s), Bubbler, Spout, etc. This option saves time on installation in the field. This unique Acorn anti-flood system prevents toilet water overflow by shutting off the water supply from the flush valve. A reset button in the chase area reactivates the system only after the waste line has been cleared. This option eliminates the requirement to manually reset the Flood-trol valve assembly by substituting a float tank for the reset button assembly. Flush valve becomes operable automatically after the flood condition has been corrected. This option is for use on combination fixtures to locate the flush valve pushbutton opposite its standard location. For example, the standard flush valve pushbutton location for -CT, -RO and -AR units is on the right hand side of the backsplash. When specified, the pushbutton will be located on the left hand side (-AL and -LO units are opposite). In most cases, this is intended to prevent interference in the chase area with other devices. For use where wall thickness exceeds 2", this option allows the slip joint nut to be more accessible, making installation easier. The outlets at each end are NPT male threaded. Flush valve must be specified separately. This option provides a flange which will accommodate a wax or rubber seal ring This is a standard feature on floor outlet and front access (Suffix Option -FA) models but must be specified on other models. This option provides an attractive high polish mirror finish seat. When specified, Acorn will provide a white plastic, hinged toilet seat. Although these seats offer obvious sanitary advantages, they are not tamper-resistant. With this option, the backsplash is extended to form an integral shelf. This provides additional space without creating areas where contraband can be concealed. This single temperature valve is for use with the Master-Trol® Plus Valve Controller. The 24VAC solenoid, soft closing valve features pushbutton activation, is provided with a stainless steel strainer and integral checkstop. Valve conforms with the lead free requirements of NSF61, Section 9, 1997; Federal Public Law 111-380 and ADA requirements. This Hot & Cold valve is for use with the Master-Trol® Plus Valve Controller. The 24VAC solenoid, soft closing valve features pushbutton activation, is provided with a stainless steel strainer and integral checkstop. Valve conforms with the lead free requirements of NSF61, Section 9, 1997; Federal Public Law 111-380 and ADA requirements. Pressing the "C(old)" button will dispense cold water; the "H(ot)" button will dispense tempered water. This single temperature valve is for use with the Master-Trol® Plus Valve Controller. The 24VAC solenoid, soft closing valve features piezo touch activation and is provided with a stainless steel strainer and integral checkstop. The Piezo buttons have no moving parts and are touch activated. When the Piezo buttons are touched this closes the circuit and activates the controller which activates the valve. Valve conforms with the lead free requirements of NSF61, Section 9, 1997; Federal Public Law 111-380 and ADA requirements. This hot & cold valve is for use with the Master-Trol Valve Controller. The 24VAC solenoid, soft closing valve feature piezo touch activation and is provided with a stainless steel strainer and integral checkstop. The Piezo buttons have no moving parts and are touch activated. When the Piezo buttons are touched this closes the circuit and activates the controller which activates the valve. Valve conforms with the lead free requirements of NSF61, Section 9, 1997; Federal Public Law 111-380 and ADA requirements. This flush valve assembly is intended to be used with Master-Trol® Plus Valve Controller and can be used on combys, toilets and urinals. The 24VAC solenoid operated flush valve features pushbutton activation and is ADA compliant. This flush valve assembly is intended to be used with Master-Trol® Plus Valve Controller and can be used on combys, toilets and urinals. The 24VAC solenoid operated flush valve features Piezo pushbutton activation and is ADA compliant. Model 1418 Comby feature the lavatory housing measuring a width of 18 inches (457 mm). The lavatory bowl is oval. Fixture is arranged to be installed on finished wall and serviced from an accessible pipe chase. Model 1418FA Comby feature the lavatory housing measuring a width of 18 inches (457 mm). The lavatory bowl is oval. Fixture is arranged to be installed on finished wall through access panels. Panels are located on front and side of cabinet and are secured with tamper-resistant screws. Model 1418LMBFA Comby feature the lavatory housing measuring a width of 18 inches (457 mm). The lavatory bowl is multi-sided. Fixture is arranged to be installed on finished wall through access panels. Panels are located on front and side of cabinet and are secured with tamper-resistant screws. © 2019 Acorn Engineering Company, Inc. All Rights Reserved.